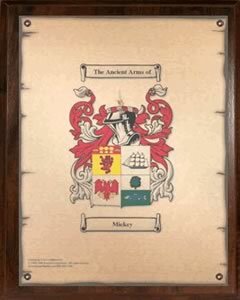 Walnut finished plaque displaying full color family crest. Protected by acrylic. 10.5" x 13" with brass studs in each corner. 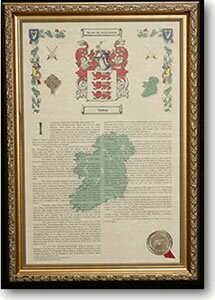 Framed full color Coat of Arms. Solid 1" wood frame measuring 10.75" x 13". Very popular gift item! 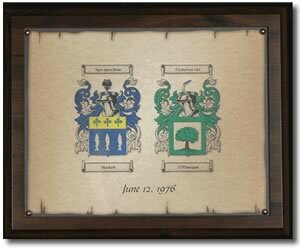 Walnut finished plaque displaying two full color family crests. 10.5" x 13" with acrylic finish. Great for weddings and anniversaries. 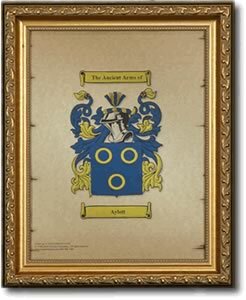 Custom made solid 1" wood frame beautifully frames the full color rendition of the earliest Coat of Arms, Family Crest and Surname History. Protected by acrylic, this lighter-weight frame is essential for hanging this piece in your home.